Enter your text just the way you'd like to see it on your case (lower case, capitals, spelling etc.) Leave blank or type NONE for no text. 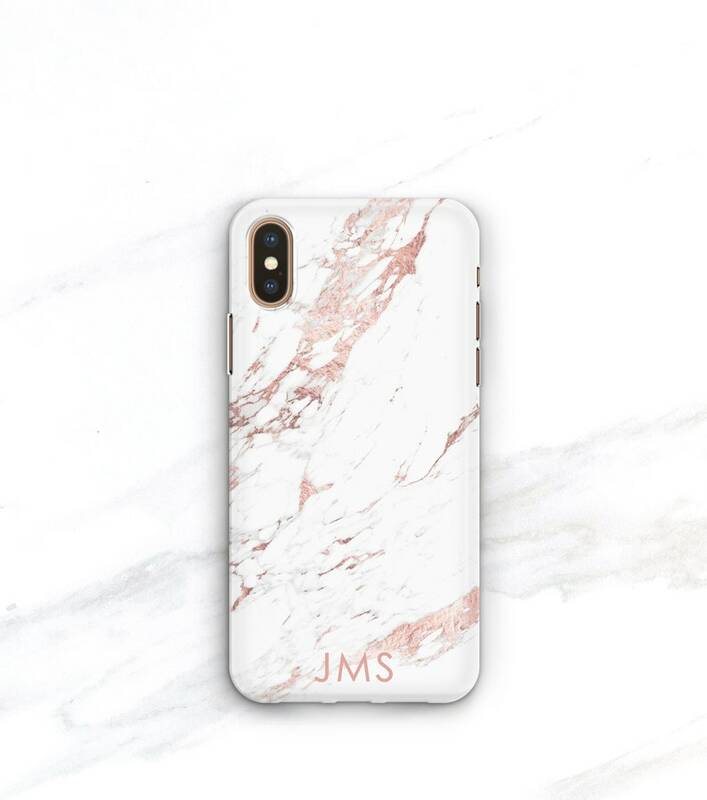 An image of polished high end white marble with rose toned veining is printed and the ink is bonded into the plastic of this glossy, slim case. The rose color is NOT metallic. A sleek, elegant touch courtesy of mother nature without the weight and bulk of actual stone. 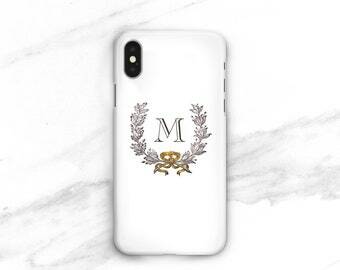 Can be personalized with a monogram or name. Leave your text in the personalization box. Type it just the way you'd like to see it on your case (lower case, upper case, capitals, spelling etc.) 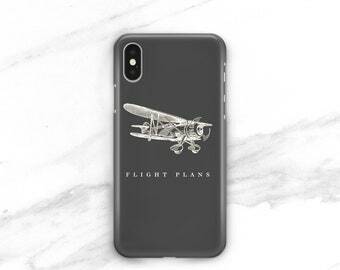 Available for iPhone or Samsung Galaxy. Made just for you, allow 3 - 8 business days before your new case ships. Yes, it comes in a gift box! The golden logo is printed on the box window, not on the case. 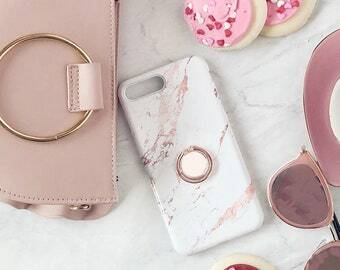 All cases are made to order. Please allow 3-8 business days before it will be ready to ship. This premium case is made from a high quality, tough and flexible polycarbonate plastic. Ink is impregnated into the plastic, leaving the glossy surface durable and easy to clean. The slim case is sleek and lightweight adding minimal bulk to your device and cannot be used with a liner. All ports are clear and open for easy access. For more shock absorbency, upgrade to the Tough case with an added rubbery plastic TPU liner. The liner can be seen around the edges of the plastic shell. A raised bumper around the face adds a bit of screen protection. The outer shell of the tough case is a tad bigger than the slim to have room for all this goodness, and cannot be used without the liner. White liners are available for some iPhones. All other device types have only black liners. Your item will be wrapped in light blue paper and topped with a tiny red bow. Charmingly elegant for any occasion. The marble wasn’t what I expected on it. But the case it’s self is great material. really pretty and personal with the initials. this was a gift for my niece and she loved it! SHIPPING - Can I get it faster? Items marked "Ready to Ship" ship out within 2 business days and can be found in the Ready To Ship section. All other cases and totes are made for you after you order it. The production process can take up to 10 business days, but we do tend to get them out sooner. Selecting a faster shipping method at checkout will not speed up the processing time, but it will speed up the time it takes to arrive once your package ships. SHIPPING - This is a gift. Wonderful! Let us know in the notes when checking out and we will leave the price out of the shipment. The boxes we use for the phone cases are just darling. You can also add gift wrap for an additional fee. For international shipments, legally we cannot mark “gift” on the customs form. SHIPPING - My international package arrived with postage due! SHIPPING - I'm having USPS tracking or delivery problems. USPS tracking is a wonderful tool, but can be delayed or missed. We have found that signing up for email updates on the USPS tracking page frequently shakes things loose within a day or two. The first thing to do is check around your property and talk to neighbors and anyone living with you as well as your postal carrier. Most packages are found behind a bush or back door. The next step involves opening an official case with USPS. Mail theft is taken very seriously by the post office, so they will conduct an investigation. While they do that, let us know what is happening so we can remake your order if needed. 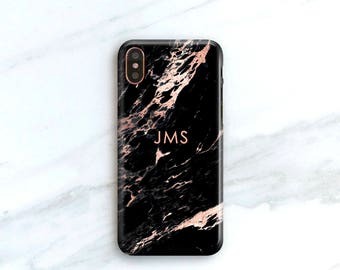 PERSONALIZING - Does this come in a different color or with text? Most items can be made in another color or with a monogram or other text for you. There is no extra charge for customizing colors, adding or changing text. Feel free to purchase the listing and write your preferences in the notes to seller during checkout. Keep in mind that I cannot print in metallics. Gold and silver will be in color only, not metallic. Totes are a natural cream color. PERSONALIZING - Do I get a proof? Digital proofs are provided for custom victorian monograms and custom silhouettes within 5 business days of purchase. Production will begin once the proof has been approved. For all other items, please write "proof" in the notes box during checkout if you would like a proof. Keep in mind that this will push your ship by date back a bit. It is helpful to make sure that our emails are not sent to your junk mailbox. You can expect a digital proof for most designs in 3 business days. 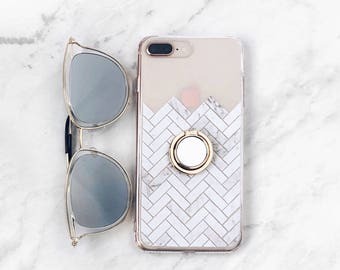 PHONE CASES - How do you put it on and take it off? Be sure that you have removed all parts of any previous case. For a slim case - Slide the side of the phone with the most buttons into the case first. Then snap the other side in by pressing the case and phone together. For a tough case - Separate the liner and outer shell of your new tough case. 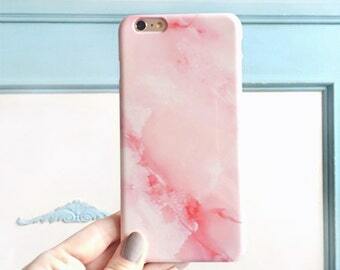 Slip your phone into the TPU liner first. Slide the side of the phone and liner with the most buttons into the case first. Then snap the other side in by pressing the outer shell and phone together. Starting at a corner of the phone, peel the outer shell away. If there is a liner, remove both the liner and phone from the outer shell at the same time. 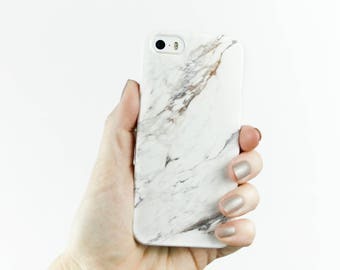 PHONE CASES - Will the white liner stain? A white liner is a beautiful choice with a white design or white iPhone. Unfortunately, just like your white shirt, shoes and bags, white liners can stain. Please, be sure to take your case off of your iPhone before you attempt to clean it. Mild dish soap may work for oil based stains and rubbing alcohol on a cotton ball may help for inks. If you'd like a replacement liner, they are now available as a separate purchase. Your new liner will only fit under a tough case shell. They will not fit with a slim case. 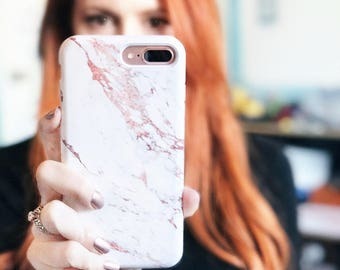 PHONE CASES - How protective is it? The SLIM case is a very slender, strong and light plastic shell - great for showing your style and protecting from scratches in you bag or laying face down on the table. The SLIM clear cases are the least protective. In order to make the case clear and lightweight, the plastics formula had to be different. 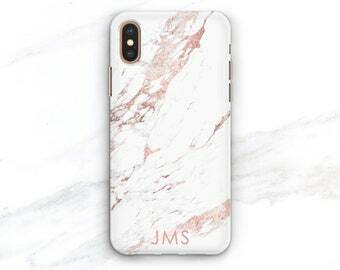 They are great for decorating your phone and protecting from scratches on the back, but are more delicate than the solid slim case. The TOUGH case has a TPU liner that adds a bit more shock absorbency for bumps and dings. 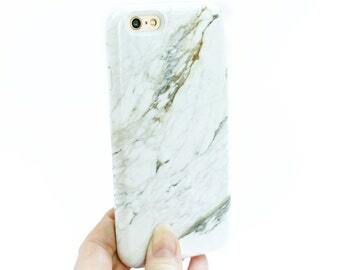 The phone cases do protect from minor impacts and scratches, but do not make your device indestructible. Joy Merryman Store cannot be held liable for any damages your device might receive while using the case. RING GRIP - How do I attach the ring to my case? The adhesive can only be used once to maintain maximum strength and is at it's strongest hold 24 hours after pressing it on.